So I was out shopping last weekend on a mission for something completely different when I spotted this shirt. All the colors and patterns caught my eye. It's silky, flowy, and I love the sleeves. Paired with these amazing J. Crew Minnie Pants and it's a match meant to be! Seriously, do you own a pair of these J. Crew pants? They are a little pricey but oh so comfortable and flattering! Some fun strappy heels and I'm set! What's your go-to outfit for a night out? I love that bright top! Especially how you paired it with such simple pieces, it really brings out the amazing patterned! Thanks Kyla! I love the pattern and fun colors of the top. Thank you! I love wearing silky, flowy blouses! Thanks! All the colors grabbed my attention. I can see so many ways to wear this blouse. That back detailing of your blouse makes the outfit!! Yes! Thanks. A little fun detail. How pretty is this top! Thanks Darcy. Lots of color has been on my radar lately! Super cute - love the top! such a pretty and unique top! Love your top! So pretty! That top is gorg!! 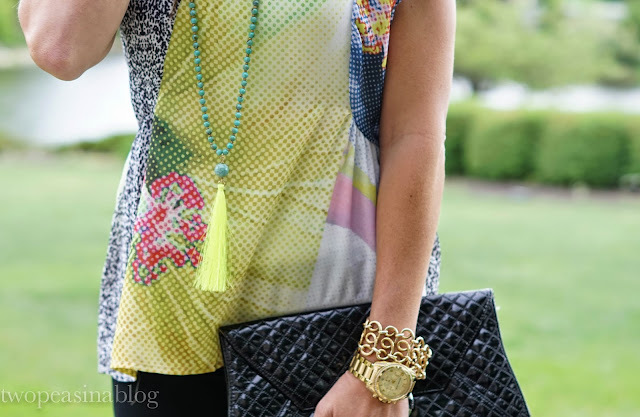 And with that tassel necklace -- perfection!! So pretty on you! This outfit looks so fun and flirty. Love the shoes!